Growing up, I only knew the regular brown lentils, and ate it the same way every single time. It was seasoned blandly, mushy and just didn't taste very good to me as a kid. I must admit though, I wasn't a fan of peas and beans overall. But still, lentils were my most hated, along with those odd-looking black-eyed peas. So when I got older, I was surprised to learn that there were other types of lentils and other ways of preparing it. I have recently begun experimenting at home with them. I found a bag of French green lentils at the store last week; they were a beautiful dark green! Cooked them up with lots of seasoning like green onions, parsley, salt, pepper, and simmered in chicken stock. Man were they good, and the boys ate them up! No lentil hate here! I was trying to think up a taco recipe with unusual, healthy fillings, and lentils came to mind. Here are my Mediterranean Chicken and Lentil Tacos. They are topped with creamy goat cheese. Yummy and healthy all in one, and they make a fun and colorful dinner for the fam. 1. Heat olive oil in a medium pot over medium-low heat. Add onion and saute for 3 minutes. Add lentils, tomatoes, garlic, cumin, parsley, sea salt and pepper. Stir and let cook for 15 minutes. 2. Heat corn tortillas by placing in a pan over medium-high heat. Heat 15 seconds, then flip. Heat 10 more seconds. 3. 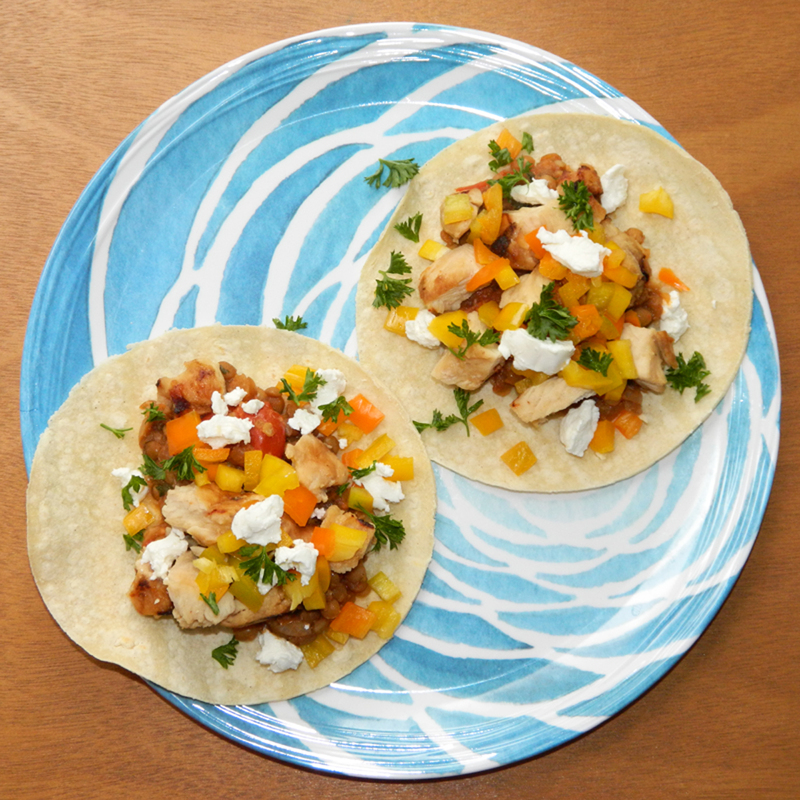 To serve, layer lentils, chicken and sweet peppers on tortillas. Top with goat cheese, sprinkle with a little parsley. Fold and enjoy!